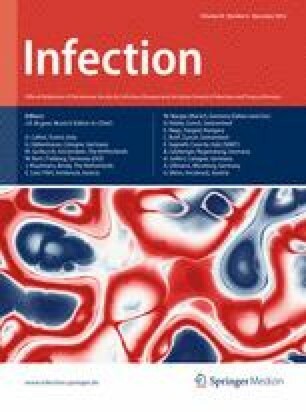 The clinical characteristics of human metapneumovirus (hMPV)-associated lower respiratory tract infection (LRTI) after allogeneic hematopoietic stem cell transplantation (HSCT) is not well described. We describe the clinical course in eight HSCT recipients suffering from hMPV infection. We prospectively included all patients with hMPV-associated LRTI after allogeneic HSCT during a period of 1 year. hMPV was diagnosed by multiplex polymerase chain reaction (PCR) from bronchoalveolar lavage (BAL). Eight patients with hMPV-associated LRTI were identified from 93 BAL samples. Three of the eight patients had co-infections with other pathogens. The median age of the patients was 45 years [interquartile range (IQR) 36.8–53.5], the median time posttransplant was 473 days (IQR 251–1,165), 5/8 patients had chronic graft-versus-host disease (cGvHD), and 6/8 patients received immunosuppression. Chest computed tomography (CT) scanning showed a ground-glass pattern in 7/8 patients. Seven of eight patients required hospitalization due to severe symptoms and hypoxemia. All were treated with intravenous immunoglobulin (IVIG), which was combined with oral ribavirin in six patients. The mortality rate was 12.5 % (1/8). hMPV-associated LRTI in allogeneic HSCT recipients are not uncommon and present with unspecific respiratory symptoms, ground-glass pattern in CT scanning, and co-infection. All authors do not have a conflict of interest.